I just read your piece quoting Senior Sergeant Dean about internet use in libraries. Firstly, given there is no linkage (at least not one made by you or the Sergeant in the article) between the use of free internet and the gang fight, I have no idea how you or he made a connection between the two. The gang members could have been there to use the loo, the free (physical) newspaper collection or (omg!) to take out a book. Second, it’s a public library. It’s not a “public that we like and have cleared past the police” library. Third: if the use of the computers is not illegal then I’m not sure how the Senior Sergeant’s views has any bearing on library policy. Does he have a library background? An understanding of library charters? Library policy making experience? An understanding of the place libraries have have historically played as both a place for books and as a place for community to gather? This idea that libraries are a place to silently go and behave in a prescribed manner and then go home quietly is so completely out of touch with what libraries have become that it would be laughable were it not so utterly dangerous. All people at a library are users. Old, young, “youths” (I’ve included the scare quotes the headline writer obviously forgot, you’re welcome). Additionally, given the absolute paucity of information in your article I’m actually unable to decide if the person who was arrested is actually a youth. Finally, I have to tell you that my first reading of “youths” and “intimidating” was that both were dog whistle code for “brown people”. This troubles me. So, to answer your “have your say” question: No they shouldn’t tighten rules. 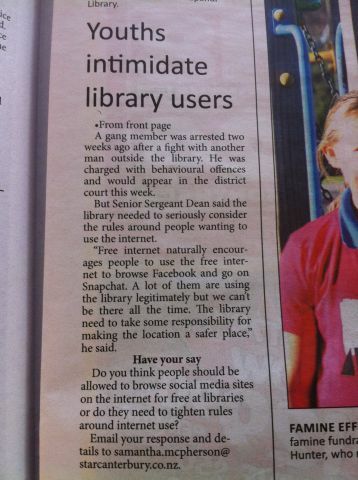 And if they need to tighten rules, it shouldn’t be because Senior Sergeant Dean has decided what is legitimate or illegitimate use of a library. Because the idea of the police deciding who belongs at a public library and what they are allowed to do when they are there should terrify anyone with half a brain.